The award honors the best of the best in this grand storytelling tradition, and its winner will receive an inscribed plaque and a $500 prize. Voting continues until August 31. Voters must register with Baen Ebooks (your information will not be shared.) You may also send a postcard or letter with the name of your favorite story from this volume and its author to Baen Books Year’s Best Award, P.O. Box 1188, Wake Forest, NC 27587. The winner will be announced at Dragon*Con in Atlanta on Labor Day Weekend. 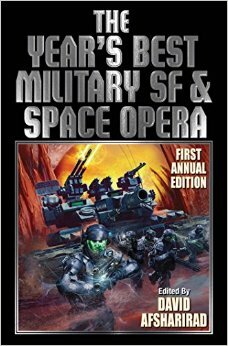 This entry was posted in Awards, Like Show Business and tagged Baen Books, David Afsharirad, Year’s Best Military and Adventure Science Fiction Story by Mike Glyer. Bookmark the permalink. So a small group of people–maybe one person?–choose a set of stories, then invite readers to choose one from among them as “best of the year”? Hmm. That reminds me of something. 2. None of the stories in SP3 or RP were good enough to reach this selection. Surely this is exactly the sort of thing that the various puppies have been championing? This is their sort of award. They should all vote for this prize, and even draw up a slate if they want to. I don’t entirely agree that it’s a bad thing if “one person” chooses the best stories of the year. This is what Gardner Dozois, Jonathan Strahan, Ellen Datlow, Paula Guran and Rich Horton do every year – and for my money their selections are a hundred miles more convincing than this year’s Hugo ballot. They left out ‘Ancillary Sword’. Irony of ironies is that the first short story in the anthology, “Codename: Delphi” by Linda Nagata is better than any of the Hugo finalists. I guess she isn’t friendly with Brad. I also read “Persephone Descending” by Derek Künsken while it was good I think the writing it from a first person perspective would make it a better story. That said probably better than all of the Novelette finalists this year. Another one who isn’t friends with the Evil League of Evil I guess. Pretty sure he took himself out of the running. If he wanted too I’m sure he could have put up one of those “Here’s what I wrote this year, consider them when nominating” posts. Those seem to be OK.
That was a good story. Neatly told – another odd not-nominated by SP work, particularly given that the author was nominated in another category. If the Hugo’s were for best Mil SciFi, and not best SciFi maybe it would have been? I read the Holly Black story and quite liked it. I quite liked the Holly Black story also. It was on my shortlist to nominate for a Hugo, actually, but I don’t remember if it made the final five. Not that *that* matters, with slate nominators running loose. But still. It’s a good story. Brad asked what I’d published that might be Hugo eligible, and I mentioned “Wisdom.” I completely forgot about Soft Casualty’s publication timeframe and potential eligibility, because I am at heart a writer, not an award seeker. I was two days late to realize it might be eligible for a Bram Stoker award, too. I appreciate the positive comments about it, Camestros. Thank you. I would assume Ancillary Sword is not in the collection because it is an entire novel. This anthology is of short stories. Peter: You restate an argument incorrectly, from a secondary source. At no point was the SP campaign about either military fiction, or even particularly conservative fiction. That is a false narrative by certain of the opposition. In fact, quite a few of the nominees are rather non-conservative, myself included. Michael Z. Williamson: I appreciate the positive comments about it, Camestros. Thank you. At no point was the SP campaign about either military fiction, or even particularly conservative fiction. At this point, there have been quite a few assertions about what the SP campaign was about from the putative Sad Puppy side, some of them mutually inconsistent. How would you phrase what the campaign was supposed to be “about”? At this point, it seems quite reasonable to posit that the campaign was about Brad Torgersen wanting various people to feel that they owed him a favor for getting them Hugo nominations, at least in some cases in exchange for future unspecified considerations. Quid pup quo, as it were. That’s one of my issues with the puppies in that in the puppies minds there was an opposition that they needed to be fought with a slate. On the first part, I don’t really know. Since we’re not any sort of consortium or conspiracy (or if we are, I have not been invited to any meetings), I’m not really aware of anything anyone may have said after the fact. As to the second part, my response would be a quizzical stare, as I have no idea what you said, why you would think what I infer you’re trying to say, nor has any such allegation been suggested. Which would, of course, suggest there is in fact an entrenched group that is counter to the Puppies. The check would be the “professionals” in the field calling me a neo-nazi, a homophobe, an extreme right winger, etc, as if those would be relevant to my writing, even if they were true. They have, however, aided me in deciding which publishers I will purchase from and submit to in the future. Camestros: I would encourage people to be as rude in response to Wisdom as I was within. If they are amusing in the process, I will promote their responses with commendations. As opposed to those sturdy professionals among the Puppies denouncing message fiction and SJWs? Your fellow travelers seem intensely interested in the connection between a writer’s views and his/her writing. In fact, it seems to be the only thing that interests them, to the exclusion of such minor details as plot, character, prose style, originality…. Then I don’t see how you can necessarily rule out what it was “about”. Just out of curiosity, how would you exemplify yourself being “non-conservative”, as you self-describe above? What was unclear? The “quid pup pro” instead of “quid pro quo?” Would it be simpler if I just rephrased it as “Brad nominated his buddies, and people he especially wanted to be buddies with in the future”? I had in mind certain points raised by Nick Mamatas, who appears to be far more aware of the details of the SF publishing industry than myself. If Mamatas is wrong on any particular that you can see, I would appreciate it if you would explain the problem with his data or inferences. I don’t see how this follows from what I wrote. I moved from arguing that SP being about “conservative SF” cannot be ruled out entirely given the incoherency of the SP promoters, to talking about favor-trading and clique support. Have any professionals in the field called you that, by the way? …but their “opposition,” we are repeatedly told, is a cabal and a conspiracy even though there are no meetings or organization whatsoever. Owl – he’s referring to a comment by Irene Gallo, who works at Tor, expressing disdain for the two sets of slatemakers on her personal Facebook page. Meanwhile, he can assure you of what the Puppies’ campaign wasn’t about at any point, because he’s apparently familiar enough with it at every point of its existence to know, but he can’t tell you what it _is_ about because he wasn’t in on any meetings and doesn’t know what anyone might have said. Well, that answers any questions I might have had about how Brad Torgerson curated the Sad Puppy slate. Depends, do you consider authors, reviewers, and people who work in the publishing industry to be professionals at what they do? They’ve been singing that particular broad brush far and wide since the nominations were announced. Those SJWs always painting the same song! As long as they remember to wash their hands before eating its all good. Anyhow, the “w” dropped out, should have said “swinging”.